It’s not new. 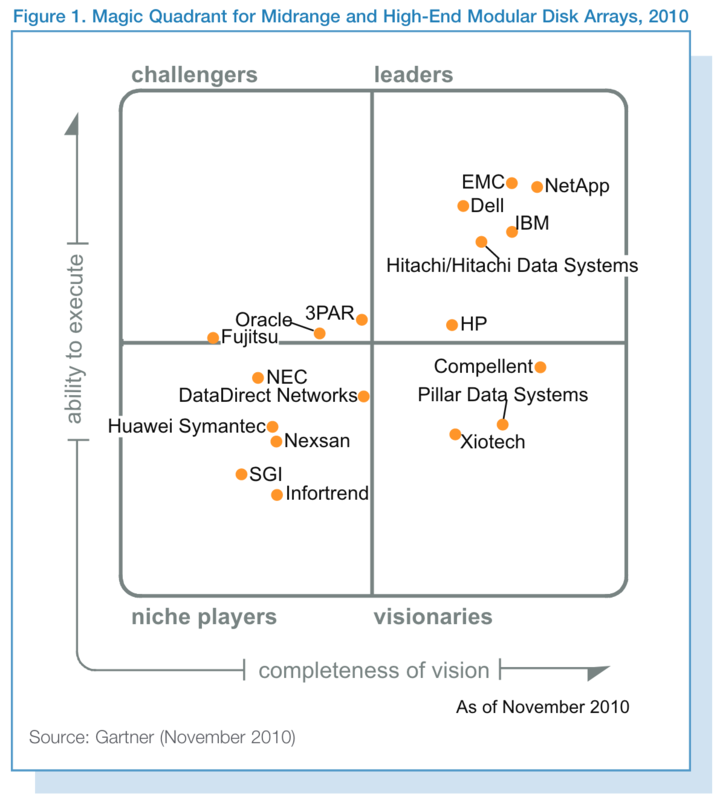 SAP has been trying to do it for years but with little success. 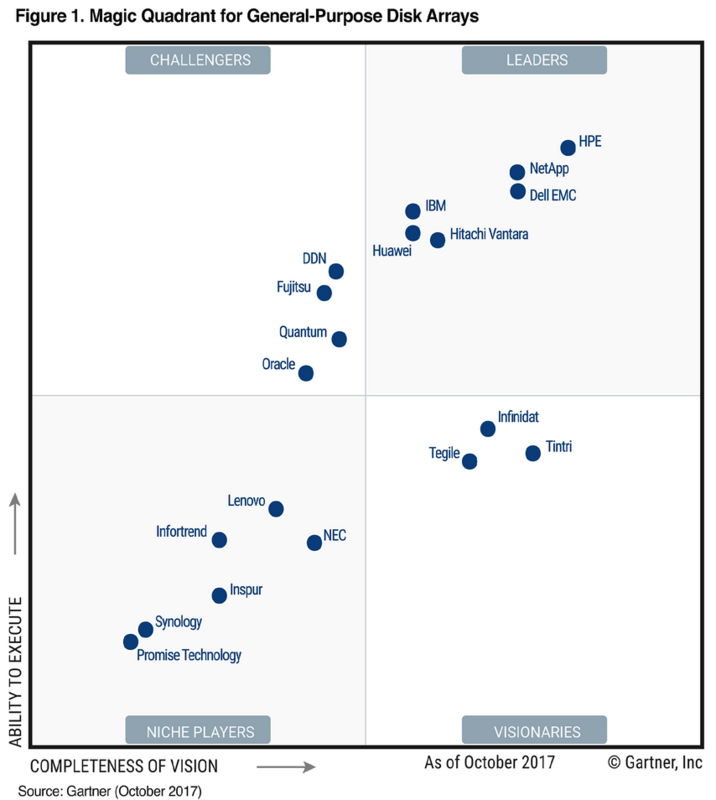 SAP applications and its modules still very much rely on the Oracle database as its core engine but all that that could change within the next few years. SAP has HANA now. I thought it is befitting to use the movie poster of “Hanna” (albeit an extra “N” in the spelling) to portray SAP who clearly has Oracle in its sights now, with a sharpened arrow head aimed at the jugular of the Oracle beast. (If you haven’t watched the movie, you will see the girl Hanna, using the bow and arrow to hunt a large reindeer). Has RAID evolved with solid state storage? Evidently, no, because I have not read of any vendors (so far) touting any RAID revolution in their solid state offerings. There has been a lot of negative talks about RAID, but RAID has been the cornerstone and the foundation of storage ever since the beginning. But with the onslaughts of very large capacity HDDs, the demands of packing more bits-per-inch and the insatiable needs for reliability, RAID is slowly beginning to show its age. Cracks in the armour, I would say. And there are many newer, slightly more refined versions of RAID, from the Network RAID-style of HP P4000 or the Dell EqualLogic, to the RAID-X of IBM XIV, to innovations of declustered RAID in Panasas. 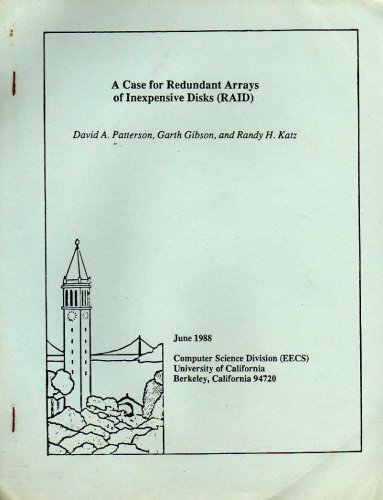 (Interestingly, one of the early founders of the actual RAID concept paper, Garth Gibson, is the founder of Panasas). 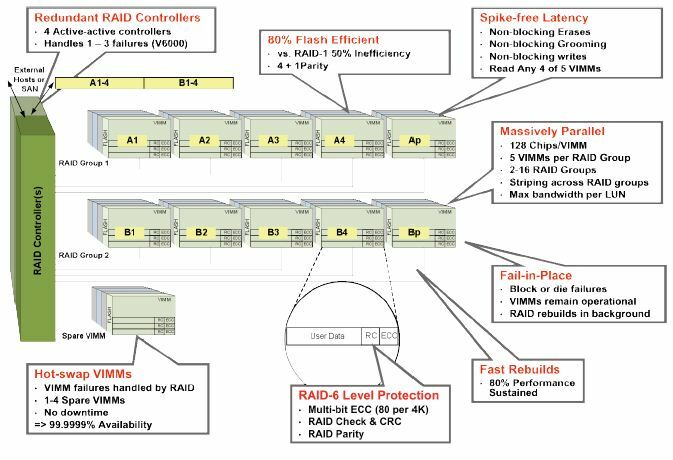 And the new vRAID from Violin-System doesn’t sway much from the good ol’ RAID, but it has been adapted to address the issues of Solid State Devices. Solid State devices (notably NAND Flash since everyone is using them) are very different from the usual spinning disks of HDDs. They behave differently and pairing solid state devices with the present implementations of RAID could be like mixing oil and water. I am not saying that the present RAID cannot work with solid state devices, but has RAID adapted to the idiosyncrasies of Flash? It is like putting an old crank shaft into a new car. It might work for a while, but in the long run, it could damage the car. Similarly, conventional RAID might have detrimental performance and availability impact with solid state devices. And we have hardly seen storage vendors coming up to say that their RAID technology has been adapted to the solid state devices that they are selling. This silence could likely mean that they are just adapting to market requirements and not changing their RAID codes very much to take advantage of Flash or other solid state storage for that matter. Violin Memory has boldly come forward to meet that requirement and vRAID is their answer. Violin argues that there are bottlenecks at the external RAID controller or software RAID level as well as use of legacy disk drive interfaces. And this is indeed true, because this very common RAID implementation squeezes performance at the expense of the other components such as CPU cycles. Furthermore, there are plenty of idiosyncrasies in Flash with things such as erase-first, then write mechanism. The nature of NAND Flash, unlike DRAM, requires a block to be erased first before a write to the block is allowed. It does not “modify” per se, where the operations of read-modify-write is often applied in parity-based RAIDs of 5 and 6. Because of this nature, it is more like read-erase-write, and when the erase of the block is occurring, the read operation is stalled. That is why most SSDs will have impressive read latency (in microseconds), but very poor writes (in milliseconds). Furthermore, the parity-based RAID’s write penalty, can further aggravate the situation when the typical RAID technology is applied to NAND Flash solid state storage. 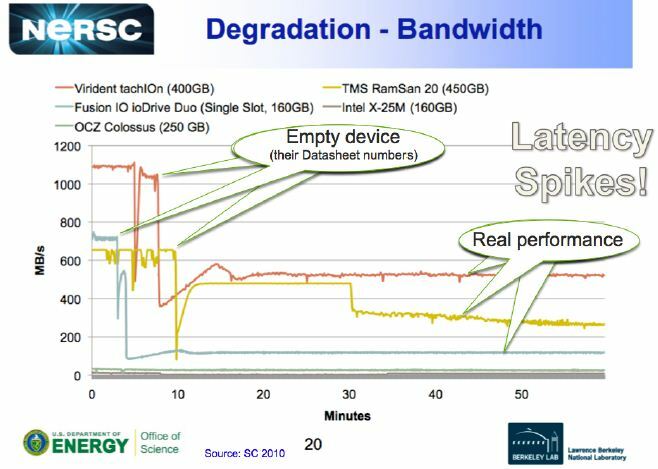 This performance degradation is part of what vendors call “Write Cliff”, where there is a sudden drop in IOPS performance as the NAND Flash SSD ages. Here’s a graph that shows the performance drop. To understand vRAID we have to understand the building blocks of the Violin storage array. NAND Flash chips of 4GB are packed into a Flash Package of 8 giving it 32GB. And 16 of these 32GB Flash Package are then consolidated into a 512GB VIMM (Violin Inline Memory Module). The VIMM is the starting block and can be considered as a “disk”, since we are used to the concept of “disk” in the storage networking world. 5 of these VIMMs will create a RAID group of 4+1 (four data and one parity), giving the redundancy, performance and capacity similar to RAID-5. The block size used is 4K block and this 4K block is striped across the RAID group with 1K pages each on each of the VIMMs in the RAID group. Each of this 1K page is managed independently and can be placed anywhere in any flash block in the VIMMs, and spread out for lowest possible latency and bandwidth. 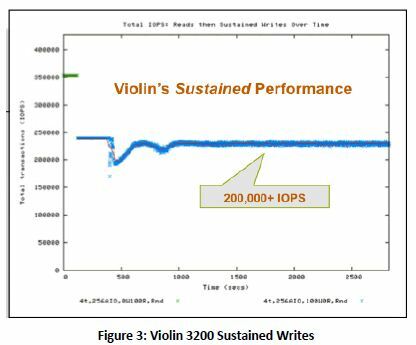 This contributes to the “spike free latency” of Violin Memory. Additionally, there is ECC protection within each 1K page to correct flash bit error. To protect against metadata corruption, there is an additional, built-in RAID Check bit to correct the VIMM errors. Lastly, one important feature that addresses the read-erase-write weakness of NAND Flash, the vRAID ensures that the slow erases never block a Read or a Write. This architectural feature enable spike-free latency in mixed Read/Write environments. I still feel that we need a radical move away from the traditional RAID and vRAID is moving in the right direction to evolve RAID to meet the demands of the data storage market. Revolutionary and radical it may not be, but then again, is the market ready for anything else? As I said, so far Violin is the only all-Flash vendor that has boldly come forward to meet the storage latency problem head-on, and they have been winning customers very quickly. Well done! Violin Memory is in our shores as we speak. There are already confirmed news that an EMC veteran in Singapore has joined them and will be surfacing soon in the South Asia region. 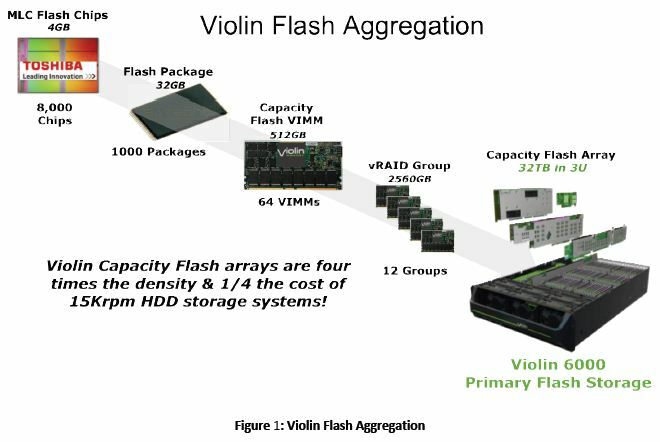 Of all the all-Flash storage systems I have on my platter, Violin Memory seems to be the only one which is ready for IPO this year, after having taking in USD$75 million worth of funding in 2011. That was an impressive number considering the economic climate last year was not so great. 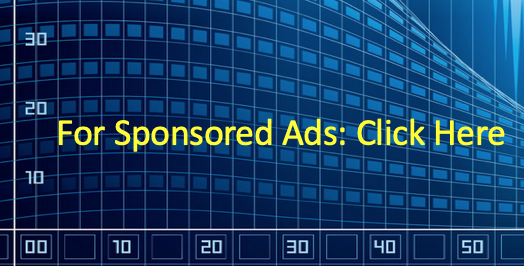 But what is so great about Violin Memory that is attracting the big money? 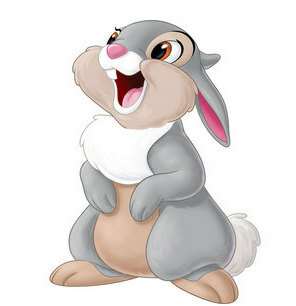 Both Juniper Networks and Toshiba America are early investors. 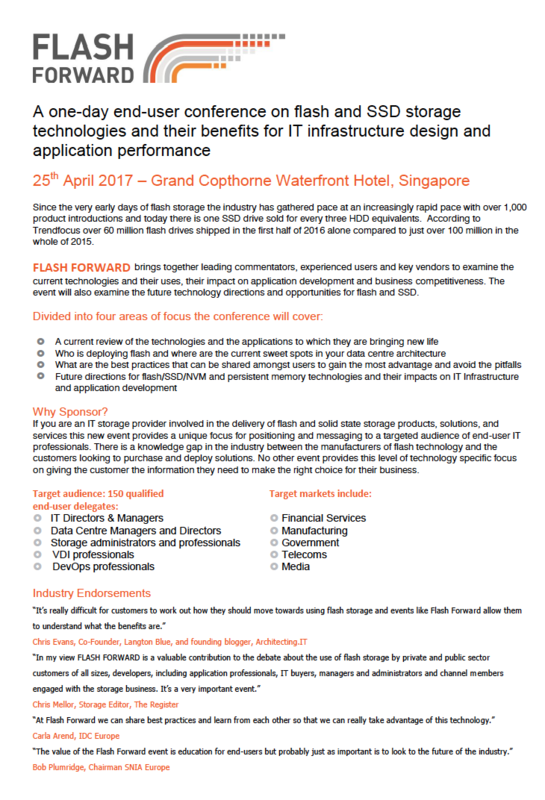 I am continuing my quest to look at all-Flash storage systems, after my blogs on Pure Storage, Kaminario and SolidFire. (Actually, I wanted to write about another all-Flash first because it keeps bugging me with its email .. but I feeling annoyed about that one right now). Violin Memory is here and now. From a technology standpoint, there are a few key technologies, notably their vRAID and their Violin Switched Memory architecture (vXM), both patent pending. 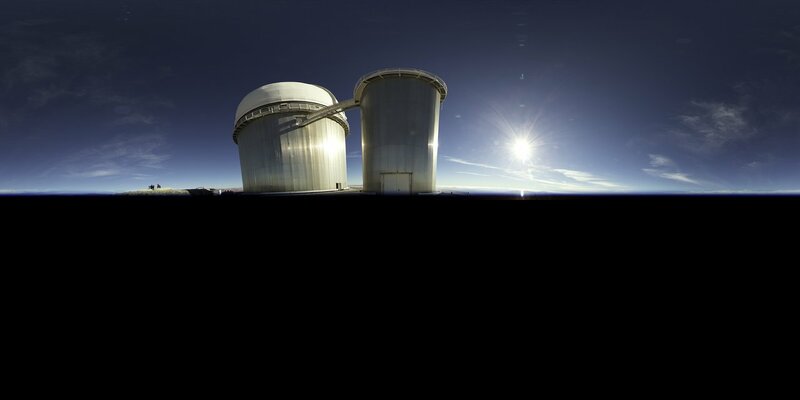 Let’s explore these 2 technologies. VIMMs are the building blocks that are the culmination of memory modules, which can be from different memory types. The example below shows the culmination and aggregation of Toshiba MLC chips, which eventually bore the VIMMs and further consolidation into the full capacity Flash array. The memory switching fabric of the vXM architecture enables very high speed in data switching and routing, and hence Violin can boast of having “spike-free latency“, something we in this industry desperately need. I don’t want to sound stupid writing about the vRAID now, and I probably need to digest the whitepaper several times in order to understand the technology better. And I will let you know once I have a fair idea of how this works. More about Violin Memory later. Meanwhile, a little snag came up when a small Texas company, Narada Systems filed a suit of patent infringement against Violin on January 5, 2012. The suit mentioned that the vXM has violated the technology and intellectual property of patent #6,504,786 and #7,236,488 and hence claiming damages from Violin Memory. You can read about the legal suit here. 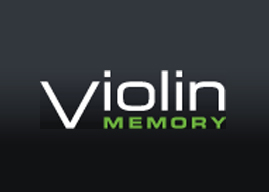 Whether this legal suit will affect Violin Memory is anybody’s guess but the prospects of Violin Memory going for IPO in just a few short years validates how the industry is looking at solid state storage solutions out there. I have already mentioned a handful solid state storage players who are I called “all-Flash”, and from the Network Computing sites, blogger Howard Marks revealed 2 more stealth-mode, solid state start-ups in XtremIO and Proximal Data. This validates the industry’s confidence in solid state storage, and in 2012, we are going to see a goldrush in this technology. The storage industry is dying for a revamp in the performance side, and living the bane of poor spinning disks performance for years, has made the market hungry for IOPS, low latency and throughput. Solid state storage is ripe and I hope this will trigger newer architectures in storage, especially RAID. Well done, Violin Memory!